You know that feeling when... you suddenly realize your doctoral research may have been influenced by a comic book you read when you were sixteen? 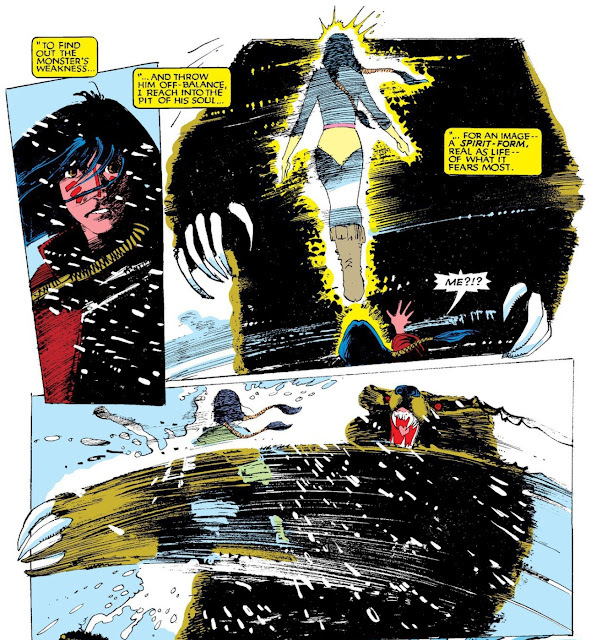 Artist Bill Sienkiewicz's brief but legendary run collaborating with writer Chris Claremont on the X-Men spinoff comic book The New Mutants (issues #18-31) had two highlights. The second was the introduction of the character Legion, who is currently enjoying a mindbending television adaptation by Noah Hawley. The first was the 1984 Demon Bear Saga (currently in production as a feature film). In these three issues (#18-20), according to Jay Edidin and Miles Stokes of the podcast Jay and Miles X-Plain the X-Men, "you’re watching the definition and scope of superhero comics change and stretch. We are – literally and figuratively – off the map." 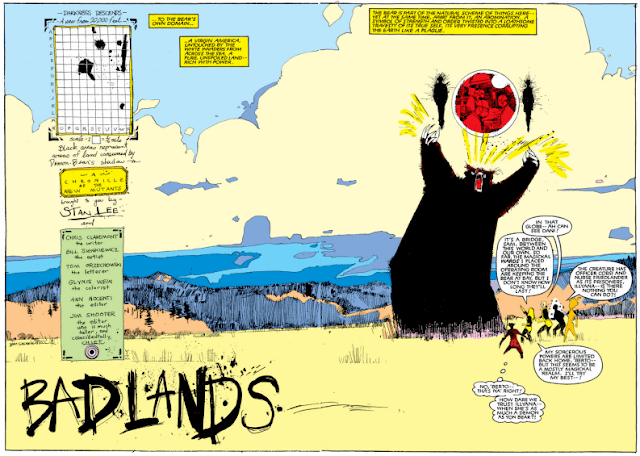 New Mutants #20, "Badlands", brought our heroes to a climactic battle on an astral-Plains. The shadowy Demon Bear, which the team originally believed was a figment of their leader Danielle Moonstar's nightmares, had attacked her and left her in hospital fighting for life. 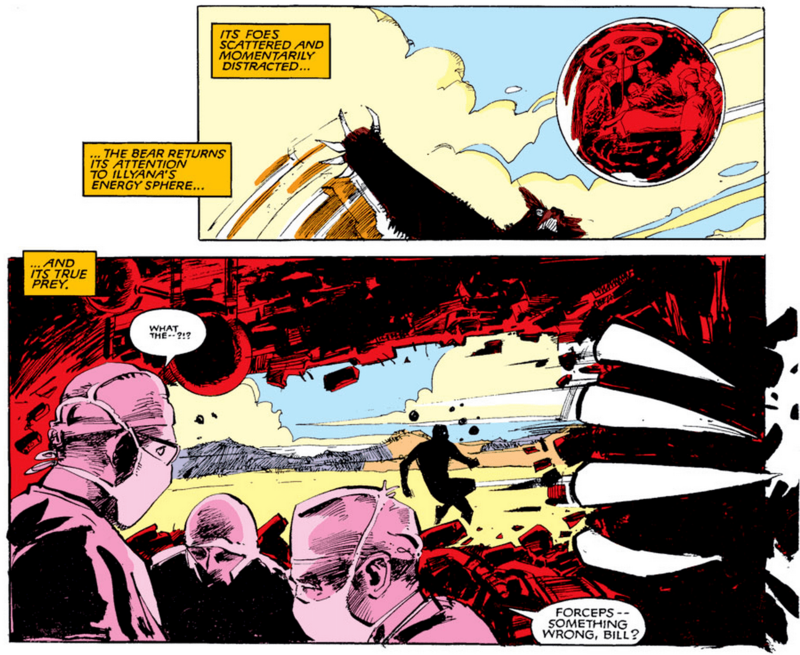 To protect Dani and the surgeons, her teammate Illyana Rasputin, a sorceress, sets up magical wards to protect the operating room (the red sphere seen here). 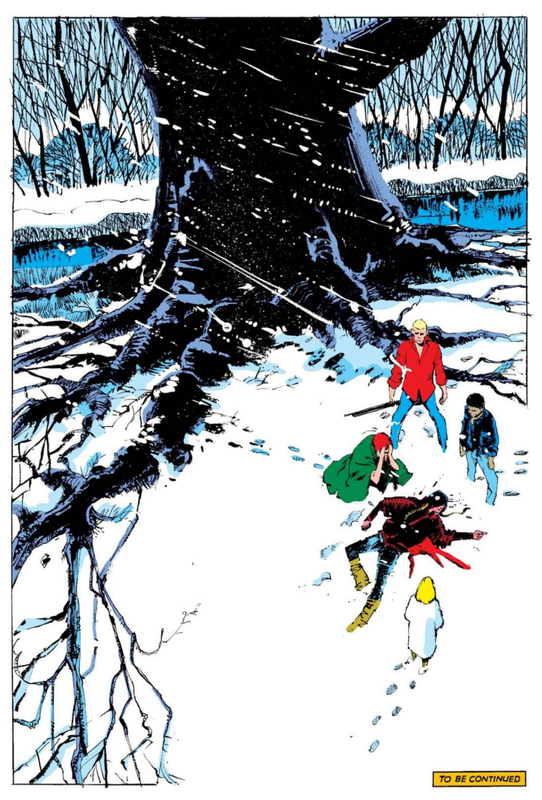 In retaliation, the monster transports the New Mutants to an alternate Badlands landscape – "The bear couldn't beat us on our turf, so he transported us to his" – and throughout the ensuing battle, attempts to slash its way into the sphere to finish its victim. Sienkiewicz and Claremont set up a "ticking clock" in the form of a map, titled "Darkness Descends: A view from 20,000 feet," which charts the Demon Bear's growing power represented as patches of shadow spreading across the land. This is the map as it appears on the opening splash page, with a legend reading "Scale: 1 ❑ = 1/6 mile. 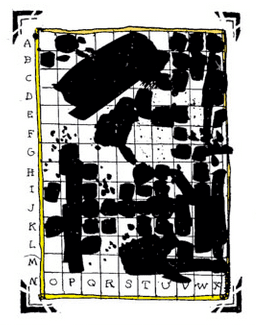 Black areas represent areas of land consumed by Demon-Bear's shadow." 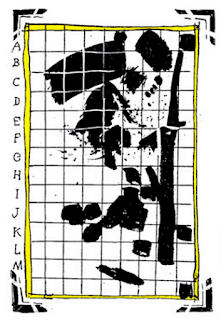 Three pages later, the caption box explains: "Unnoticed as yet – wherever the bear's shadow falls, day becomes night. And as its unholy darkness spreads across the land, its power grows..."
When I re-read the comic recently, I was gobsmacked to realize that the shadowpox live VFX that LaLaine Ulit-Destajo and I have been developing work in roughly the same way, only with shadow spreading over the infectee's body rather than across a landscape. Sienkiewicz's inkblot map came back to me while reading Eve Tuck and Wayne Yang's powerful article "Decolonization Is Not a Metaphor" this week. The Demon Bear shadow-chart seems at first simply to invert the colour-coding of the figure above. According to Tuck and Yang's legend, the dark patches are "Lands held by Indians or returned to Indians," while the light patches are "Lands transferred from Indians to Whites." 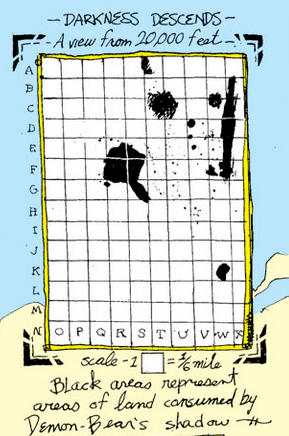 But looked at more closely, the New Mutants map is not a two-party chart. It brings a third element into the frame. After all, the character of the Demon Bear doesn't represent any particular person or people – either Indigenous or settler. It is the antagonist of this story, but it does not neatly map onto any historical or present-day human identities. Rather, it embodies an emotion, a state of being, that any of us humans can fall prey to. And the story explores one way to save ourselves from being consumed by its darkness. "The New Mutants asked what might bind mutant outcasts together when the terms that defined their exclusion from proper humanity no longer functioned as a shared ground of identification. The series' attempt to imagine new terms for the production of solidarity in a neoliberal world order echoed the various world-making projects of superhero comics in the postwar period, including the Justice League's ethical citizenship, the Fantastic Four's comic book cosmopolitics, and the X-Men's queer mutanity." 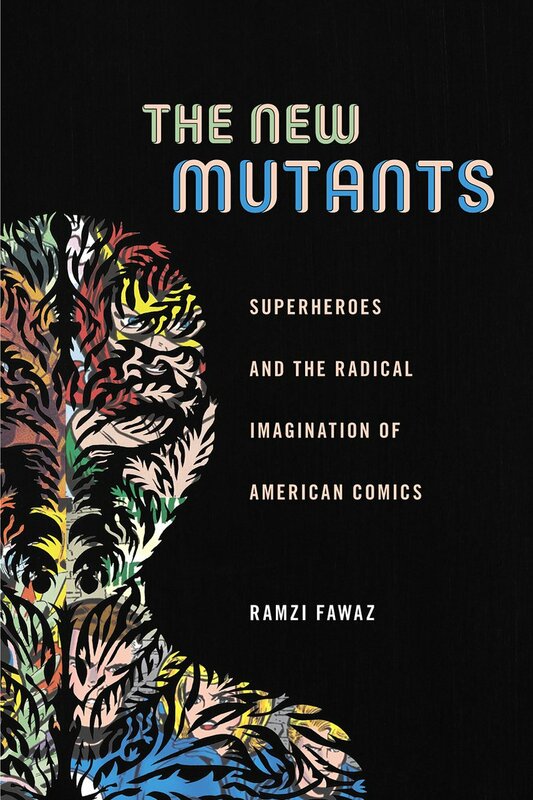 To stress unpredictability and contingency as the defining characteristics of mutant ability, The New Mutants turned to the realm of magic, defining mutant powers not merely as a material effect of unique biology but also as an enchanted form of acting upon the world. Magic is an inaugural act that brings something into being that previously did not exist or remained invisible to the eye. Consequently magic forges seemingly impossible relationships between objects separated by time, space, and kind. In this way it functions like the practice of politics, which 'consists in building a relationship between things that have none' for the purpose of 'articulating matters of common concern.'" 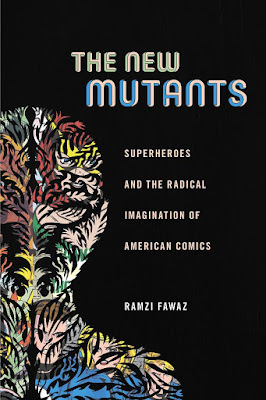 The New Mutants used popular fantasy to visually depict what it might look like to actually inhabit another person's perspective, using the unpredictable developing mutant powers of its characters as an avenue for performing and developing the faculty of radical imagination." "some ethical ground upon which to forge solidarities despite the unwieldiness of one's identity. In The New Mutants that ground was a bond of trust between the teammates based on a promise to protect their companions and facilitate one another's personal growth in an atmosphere of mutual support. [Linda] Zerilli elaborates: "This phrase, in its utter simplicity and multiple, quotidian articulations, symbolizes... an exit from the impasse of feminism's freedom of the will. To say or to hear 'Go ahead,' and to act publicly in accordance with that phrase, is to take leave of feminism's injury identity... without denying one's membership in a group called women." This demanded a willingness to recognize and affirm one another's ability to act in the world despite myriad oppositions to one's freedom, while accepting the judgments of one's fellow teammates as genuine interlocutors." At the beginning of the Demon Bear storyline, Dani's teammates had dismissed her vivid nightmares of the bear who murdered her parents as a creature of her imagination. Dani equally refuses to confide in them, even when her friend Illyana asks her point-blank, "A penny for 'em, Dani?" Her evasive answer: "I'm wondering... if I dare trust the others anymore." While she is technically referring to her team's recent encounter with a telepath, her words will resonate as a theme for the storyline to come. Each of the New Mutants will have to learn whether and how to trust the other members of their team if they have a hope of surviving this fight. This is a classic trope of superhero team books – probably the trope – but with good reason: living well with those who differ from us takes hard work. After evading Illyana's concerns, Dani ventures out alone into a night blizzard to challenge the bear. "She'd help if I asked. They all would. They don't understand – this is something I have to do alone.... It was always me he wanted. I won't see anyone else suffer in my place." The Demon Bear answers her summons. After a four-page one-on-one battle which Dani seems at last to have won – "I've slain the demon-beast that murdered my parents! At last, their spirits are at rest. And my nightmare is..." – the bear's eyes open. Her teammates race from the house to investigate a scream. As Dani fights for life in the hospital, Fawaz frames her friends' efforts "to develop a collective response to a previously imagined threat" as more than just protecting her – and the wider world – from the the Demon Bear's assault. Their earlier inability to "believe in magic" represents a failure of imagination-as-empathy, a lack of solidarity which also contributed to Dani's inability or refusal to confide in them. 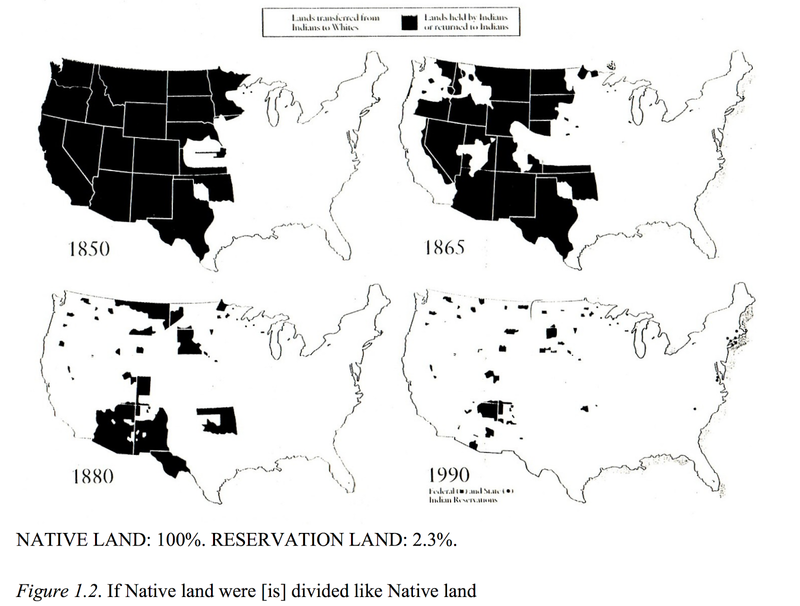 "Doing so requires them to face the wounded history [the bear] embodies, namely the scars of white imperialism and Native American genocide." 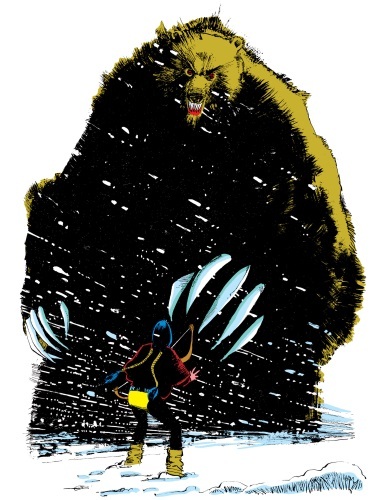 In her final encounter with the beast, Illyana sees in its visage an image of herself, acknowledging her kinship to the very malevolent forces embodied by the bear. While the beast represents a history frozen in memory by unforgiven historical atrocities... Illyana's future is yet to be decided, an open landscape of possibility underwritten by the bonds of trust she shares with her teammates." All this is feeding into my thoughts watching the storm of controversy around the cancellation of the production Kanata, directed by Robert Lepage for the Théâtre du Soleil led by Ariane Mnouchkine, theatremakers whose work, integrity and nuanced social-justice explorations I have admired for decades. The decision to cancel was Lepage's, based on a key venue, New York's Park Avenue Armory, withdrawing support due to the controversy. Most of the show's original critics, artists themselves, had not called for such drastic action. Their goal was visibility and inclusion, not intimidation or censorship. On the other hand, also lost in the storm was the fact that the Théâtre du Soleil is not a typical company which hires actors anew for each short run. 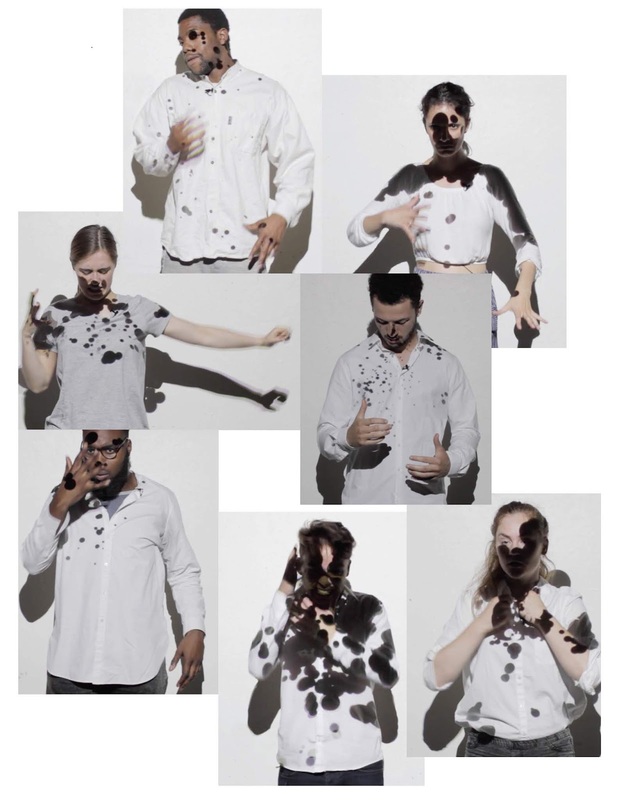 The Paris-based resident collective has about three dozen actors, many of whom are immigrants or refugees, and many of whom have been with the troupe for years or decades, participating in a collective creation process that takes up to two years for each show. Lepage is the first person Mnouchkine has invited to guest-direct a production in their 54-year history. Many commentators understandably assumed Kanata was being created by Lepage's Quebec-based company Ex Machina, which would have made its failure to include any Indigenous artists baffling, especially as Ex Machina had collaborated with the Huron-Wendat Nation on a production of The Tempest in Wendake in 2011. Even so, while the logistics of bringing Indigenous Canadian actors to join the Soleil in France for two-plus years might have been challenging, they were not impossible. Apart from a few photos, there has also been almost no glimpse yet into what Kanata was actually going to show and say. A statement by co-writer Michel Nadeau said, "We never spoke on behalf of Indigenous people; the point of view was always ours.... The story of the play... is a fiction, three interlinked stories, which happen in three places and three different times in Canada, where each time a European artist connects with a First Nations person and, as a result, finds out what happens in this nation over a period of two centuries." 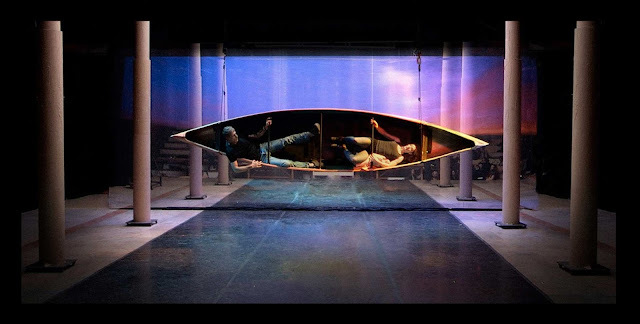 It is a great shame that Ex Machina and the Théâtre du Soleil could not have found some way for the show to go on in Paris despite the Armory's withdrawal, with the addition they had suggested of a "fourth chapter" or an entire answering production created by Indigenous artists. As much as I wish the show had been created with in-depth Indigenous involvement from the start, I still regret not being able to see, consider and debate it in its final form, as opposed to speculating about what kind of animal it might have been. I hope there is still a chance something will come of it, perhaps in a very different incarnation, at some point in the future. As a white settler, my first introduction to a number of cultures not my own came through art created by white folks, settler or European. The multiethnic characters of the X-Men and New Mutants comics were one example. Another was when I first met the Indian traditions of Kathakali, Bharata Natyam and Kutiyattam through the Théâtre du Soleil's stunning four-part Greek tragedy Les Atrides (more video here). However we define cultural appropriation in the wider context, it's a ship that needs turning, and the turn is taking longer than it should. It's always painful, however, to watch bombs detonate and wounds re-open when any debate goes nuclear on social and news media, especially when the outrage of a few drowns out so many more people of goodwill who are trying to speak productively and hear the nuance in one another's replies. No matter how urgent the need for change, it's difficult to believe any more progress is actually made through the language of attack than through the give-and-take of discussion. I might be wrong about that – my colour and background obviously lower the stakes for me. Centuries of expropriation and appropriation are a pretty damn valid reason to be angry. I'm only worried that the emotional inflammation of outrage makes it harder for anyone to check facts (and check privilege) before they act. We've also learned this year how easy it is for outrage to be weaponized. A person infected with shadowpox looks kinda like this. So does a person infected with outrage. Shadowpox is as much a metaphoric exploration of the collateral damage caused by an outrage chain-reaction – the kind of inflammation that social media algorithms or even old-fashioned sensationalist journalism seem built to boost and profit from – as it is about actual biological viruses or vaccines and the immune response they provoke. I see both rhetoric and storytelling as creative acts that can have destructive consequences – sometimes these are not intended, sometimes they are. Does uncompromising language and worst-case interpretation from the fewest, loudest voices on one side or the other ultimately break deadlocks and bring about the change we need, or does it shut down discussion, polarize and even demonize? Contemplating her team's options at the climax of the battle with the Demon Bear, Illyana muses, "We have to act now, and we dare not make a mistake – but our ignorance cripples us." I'm still figuring out what I need to learn from the Kanata controversy – especially given that the Shadowpox project seeks to bring together participants from several cultures on several continents. I don't have an answer yet, but I'm walking with the question, and reading as many voices as I can. "The central thematic of 'The Demon Bear Saga' lay not in an image of the harmony of all things but in each teammate’s development of a faculty of radical imagination, the ability to see from each other’s viewpoints as they faced a shared threat from competing perspectives. The narrative itself is visually organized around the teammates’ transition from individual and atomized worldviews born of personal experience to acceptance of the plurality of experiences that shape their diverse kinship."